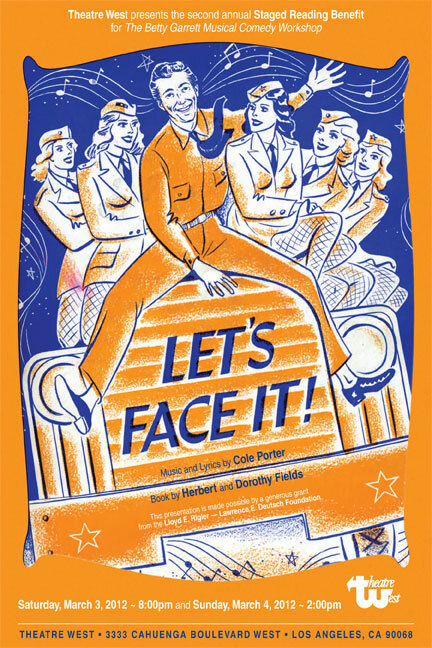 David will be appearing in Cole Porter’s Let’s Face It as Theatre West. The production, produced in association with the Cole Porter Estate, will benefit the Betty Garrett Musical Comedy Workshop. David will be performing as a member of the legendary vocal group The Pied Pipers. For more information, visit the Theatre West website. David will be appearing once again with the Jimmy Dorsey Orchestra for their annual holiday tour. All the drama and romance of the famous Robin Hood legend in a brand new opera. They’re all there: Robin Hood, Maid Marian, Friar Tuck, Little John, the Merry Men, Richard the Lionhearted, the evil Prince John and the Sheriff of Nottingham. It’s the original legend from the original sources, but told like Les Miz in an all sung opera that is filled with the familiar phrases of the Robin Hood legend. 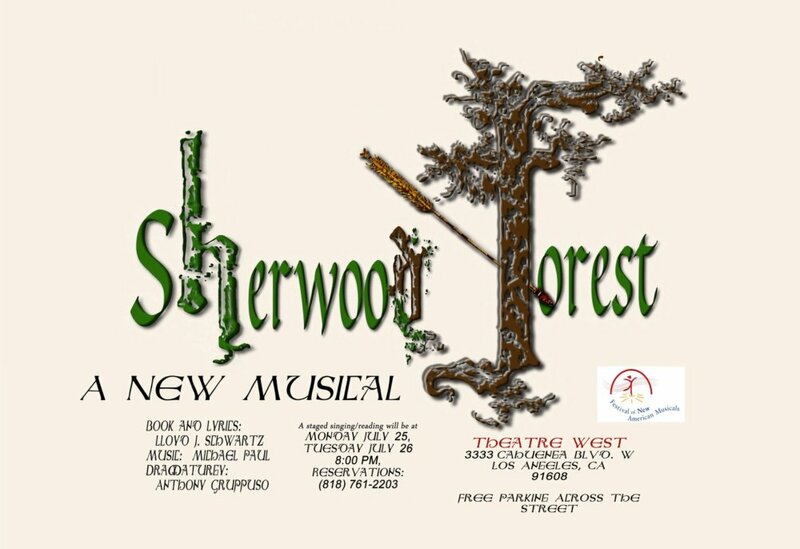 Songs like “Bow and Arrow,” “Let the Better Man Pass,” “Take from the Rich,” “Behold the Merry Men,” and the haunting anthem “Sherwood Forest” create a bold new work. 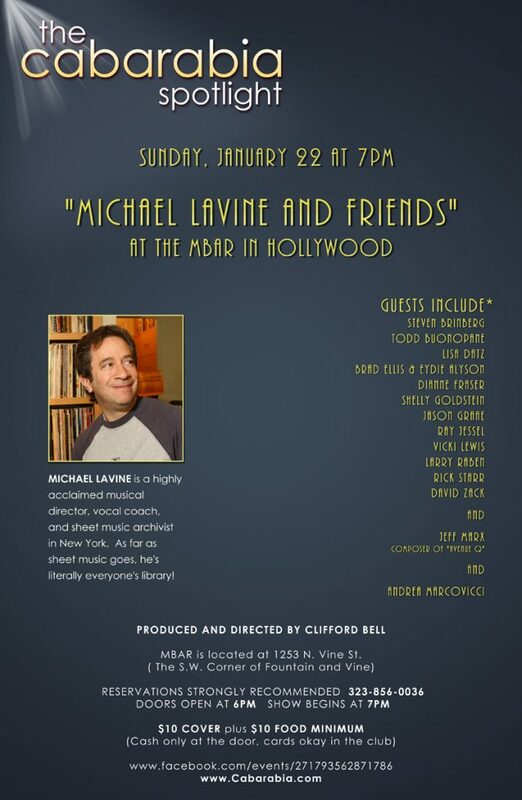 David will be joining New York Musical Director extraordinaire Michael Lavine at the MBar alongside a terrific roster of singers. For more information: https://www.facebook.com/events/271793562871786. David will be joining Jason and Georgia in a concert to benefit the Pasadena Presbyterian Church. For more details about the event, visit the Facebook page. Tickets are available here. 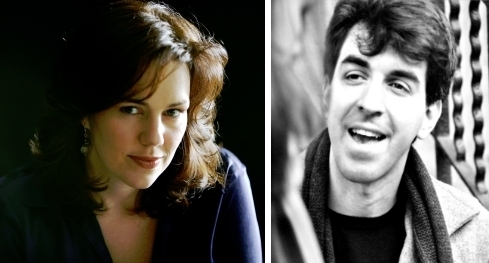 Broadway comes To PPC for one night only, when husband and wife musical theater composers JASON ROBERT BROWN and GEORGIA STITT share the stage with their talented friends. JASON ROBERT BROWN has been hailed as “one of Broadway’s smartest and most sophisticated songwriters since Stephen Sondheim” (Philadelphia Inquirer), and his “extraordinary, jubilant theater music” (Chicago Tribune) has been heard all over the world, whether in one of the hundreds of productions of his musicals every year or in his own incendiary live performances. GEORGIA STITT has been called “a songwriter with a truly distinctive writing voice; a voice that blends theater, pop and classical flavors into a sound all her own” (Craig Carnelia). Her music is “highly recommended. Reflective and personal, but with the intelligence and craft of good theatre songs” (National Public Radio). with TY TAYLOR, ALLIE TRIMM, AMY RYDER, LARA PULVER, DAN CALLAWAY and TRACY NICOLE CHAPMAN! 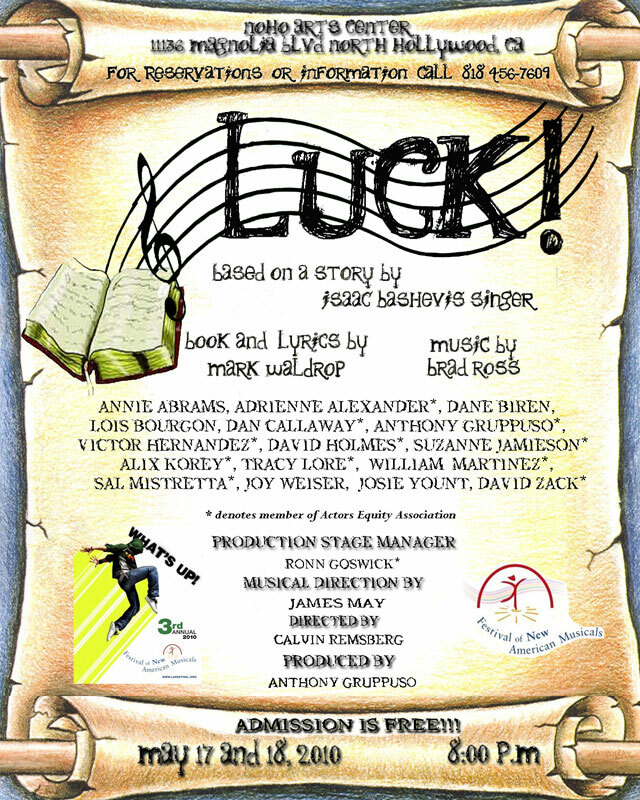 David appeared in the staged reading of Luck!, by Mark Waldrop and Brad Ross. The reading, part of the Festival of New American Musicals, took place on May 17 and 18, 2010 at the NoHo Arts Center. In this fractured folk-tale based on a story by Isaac Bashevis Singer, Mazel and Shlimazel, the spirits of Good Luck and Bad Luck, make a bet to determine who is the more powerful. The terms: Mazel will take a hapless young man named Tam under her wing for one year, at the end of which Shlimazel will attempt to undo everything she has done in one second. And that’s the point when Tam and the beautiful princess with whom he’s fallen in love must rely on their own ingenuity to save the kingdom and keep Tam’s neck out of the hangman’s noose. Along the way, matters are complicated by a crafty prime minister, a superstitious nurse, and a lion on the loose! Admission is free, please call to reserve tickets 818-456-7609. David appeared in the staged reading of The Roxy, score by Shelly Markum and Adryan Russ, libretto by Howard George and David Bryant. The reading will be on April 5 and 6, 2010 at the NoHo Arts Center. David performed with the Jimmy Dorsey Orchestra in Bradenton, Florida.